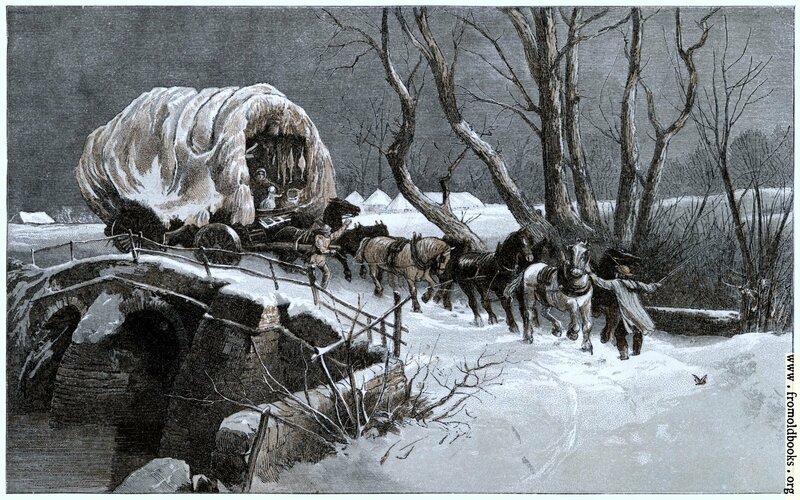 A covered wagon, drawn by four pairs of horses, crosses a snow-covered stone bridge over a river in this chromolithograph. I’m not sure whether the wagon brings gives or relatives or is coming to take away naughty children, as the book doesn’t seem to say. But it would make a fabulous christmas card. Note: a consequence of resizing the image, which is an engraving and not a four-colour separation, is that the saturation of colours varies at different sizes. I tried to correct for this a little. 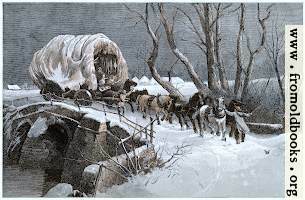 The full-sized image for purchase is large enough for a billboard, or you could crop out just a detail of the picture, and because the image is made from solid colours and engraved lines and dots, the black line remains sharp. The engraving is unsigned as far as I can see.